The latest auto startup to make a splash at CES is Byton, and tonight the new company unveiled its first vehicle: an electric crossover-looking thing that will launch in 2019 and start at around $45,000, the companies co-founders said. It will also have what Byton described as the “world’s first coast-to-coast display.” It’s 49 inches across the front center console. This was Byton’s big reveal, and, I have to say, I came away impressed—if they can follow through. The car will be built at Byton’s massive manufacturing plant in Nanjing, China, and its launch, Byton said, will be “global” off the bat—which means for the Chinese market, but also (probably) for the U.S. and Europe as well. Let’s get to the specs, or at least the ones they revealed during the launch event: The car is 191 inches long, 65 inches tall, and 71 inches wide. An all-electric, its range on the base model is 250 miles, and Byton says its battery can charge 150 miles worth of range in just 20 minutes, and 80 percent of the battery’s total charge in 30 minutes. Overall it’s nice on the outside, if, like most of these tech startup crossovers tend to be, a bit indistinctive. Unique design doesn’t seem to be their thing quite yet. You’ll notice that there are a lot of screens—the giant screen in front, but also two screens for rear passengers, and a screen on the steering wheel, all of which Byton says is meant to be something like a smartphone on wheels. Integrated with a customized version of Amazon’s Alexa service, the car can also monitor your heart rate and blood pressure to better inform you about your health. The car will be Level 3 autonomous at launch, the company said, and will have the platform to be Level 4 at launch as well, if not there quite yet. In development for two years, one of the more interesting features about the car is its lack of side mirrors—instead, it has tiny cameras, which will show you what you need to see on the giant console. 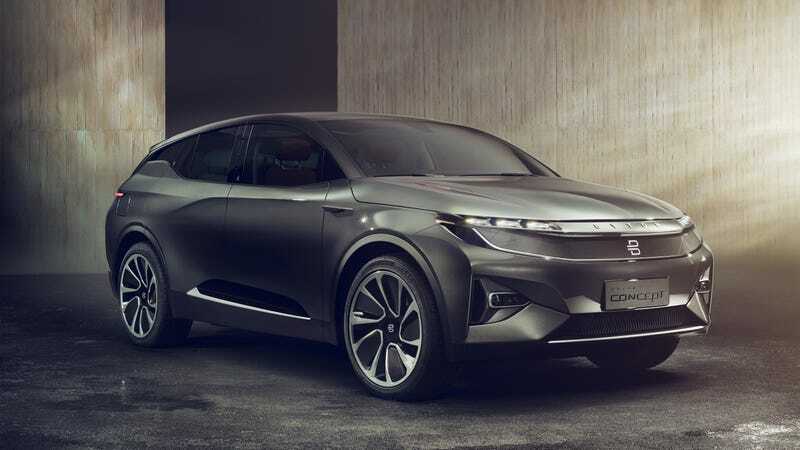 Sedan and MPV concepts will also be coming, though the Byton founders did not specify a date. It’s now up to Byton to prove that they can bring this car to production. After the debacle that has been Faraday Future (whom we will supposedly hear more from at CES, and whose employees have actually fled to Byton in recent months) it is natural to be skeptical of these Chinese-backed EV startups and their ambitious technology plans. We’ll see! Oh, and I was wrong about the name—it’s pronounced “bite-in,” despite being inspired by the phrase “byte on wheels.” We can’t have everything.